While many of the world’s castles were built for the practical purpose of protection, they are also some of the most stunning and impressive examples of architectural styles over the centuries. Take a look at 30 of the most beautiful castles in the world that have stood the test of time and continue to leave us speechless by their grandeur. 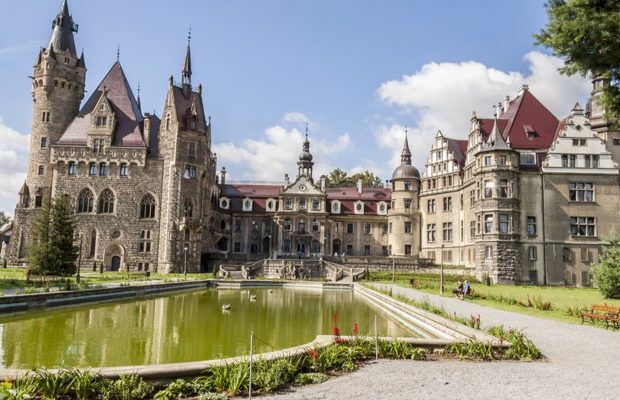 This German castle is located in Bavaria and was built by King Ludwig II in the 19th century. It went on to become the inspiration for Disneyland’s Sleeping Beauty Castle. Slovenia’s Predjama Castle was built into the walls of a natural cave about 800 years ago. It’s officially the largest castle in the world. The Romanian castle located in Transylvania was built in the 12th century and later became known as Dracula’s Castle after author Bram Stoker set his famous novel there. The Scottish castle is one of Scotland’s most famous sites. Construction began in the 12th century and different parts of the castle continued to be built into the 20th century. The Egeskov Castle was built in the mid-16th century on Funen, an island in Denmark. Over the past 400 years, different families have owned and lived in the incredible Renaissance structure. Construction on the French château in the Loire Valley finished in the 17th century. It is now a UNESCO World Heritage Site. The Moorish palace and fortress was built between 1238 and 1358 in Granada, Spain. It is now a UNESCO World Heritage Site and is one of Spain’s most popular tourist attractions. The Portuguese palace is located in Sintra, Portugal. It started out as a chapel in the 12th century but was turned into a stunning palace by King Ferdinand II in the 19th century. England’s Windsor Castle is the largest and oldest occupied castle in the world. It was originally built by William the Conqueror around 1070 and has since been the home to British monarchs for more than 1,000 years. The Swiss castle sits on a hill in the town Sion. It was built between the late 13th and early 14th centuries and is still standing even after multiple rebellions and fires. The castle, which was built in the 13th century and rebuilt at the end of the 19th century, is the biggest castle in the Netherlands. The medieval castle is now a museum and regularly hosts exhibitions and events. The Estonian castle was built in 1892 and now functions as a hotel and restaurant. It is also a popular location for weddings. Vianden Castle was built between the 11th and 14th centuries in Luxembourg. It has been owned by several owners through the centuries, but after it was neglected, the state took over the property and restored it. The Slovakian castle was originally made of wood when it was built in the 12th century. However, it was reconstructed with stone in the 1200s. It currently is home to an art and history museum. The Irish castle is about an hour outside of Galway. It was built in the late 19th century and is now a monastery run by the Benedictine community who have called the castle home for almost 100 years. The Swedish castle was built in the mid-14th century as a defense tower. It was later expanded and is now a popular tourist destination. The castle was built in the early 12th century in the old city of Riga in Latvia. It has been reconstructed several times and recently was renovated after a fire. The Welsh castle was built by Edward I in the late 13th Century. The castle, which is guarded by 22 towers, is currently a UNESCO World Heritage Site. The Czech Republic castle and UNESCO World Heritage Site was founded in the 9th century. It is officially the largest coherent castle complex in the world. The 900-year-old Austrian castle was constructed around 1077. Over the years it has been used as a stately home, a military training center, and a police school. It’s now a popular tourist attraction after appearing in the film, The Sound of Music. The Italian castle in Rome was built as a tomb for Emperor Hadrian and his family in 123 AD. It later was used as a jail, a fortress, a museum, and even a home for the Pope at one point. The palace in Belarus was built in the 16th century. It was rebuilt several times over the years which resulted in a mixture of Renaissance, Baroque, and Modernist architectural styles. The Croatian castle was originally built as a fortress in the late 13th century. It fell into disrepair in the 18th century but has since been restored and now serves as a museum for the public. The Norwegian castle was built in 1299 and later became a fortress in the 1500s. Hundreds of years later it was turned into a royal residence, but it now functions as a site for events like concerts, ceremonies, and public holiday celebrations. The castle in Moszna, Poland was built in the 17th century. The massive structure contains 365 rooms and has 99 turrets. The Greek castle was built in the early 13th century by the Venetians. It’s one of the Mediterranean’s largest castles. The Albanian castle was built around the 5th or 6th centuries and has remained standing despite several rebellions and sieges. It’s now a museum home to an ethnographic exhibition about rural Albanian traditions. The Hungarian castle is a landmark in Budapest and was built in the 13th century. It’s now home to the Budapest History Museu and the Hungarian National Gallery. The French palace was once the principal residence of French royalty from 1682 under Louis XIV until the start of the French Revolution in 1789 under Louis XVI. It’s currently a UNESCO World Heritage Site and nearly 8 million people visit the palace to see the grand structure, opulent rooms, and stunning gardens.